Slotted Fum Hoods are available in a vast array of sizes With numerous accessories. Side skirts are a common addition. 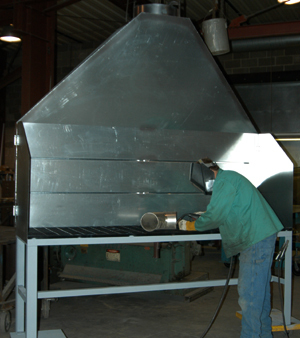 The hood may also be connected to a welding table. Typical hood depth is 6" for standard models. SFH Models include 34", 46", and 58" wide. Air patterns pull harmful fumes and particulate from breathing zone. Table or wall mount available in confined space. Options include: table, side skirts, and adjustable slot design. Available materials are: galvannealed, steel, stainless steel, aluminum, and corrosion resistant FRP. Also, custom sizes and elements are available. Also, custom sizes and elements are available.